Mason jars are not merely used for storing food or preserves. They lend themselves to a variety of craft projects. 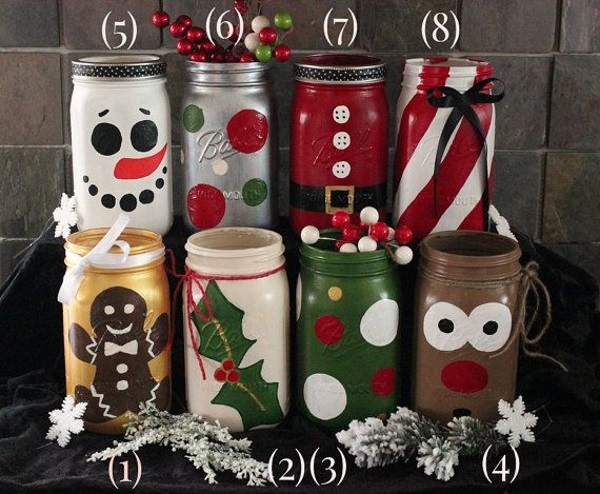 How about creating some Christmas Mason jar crafts this holiday season? 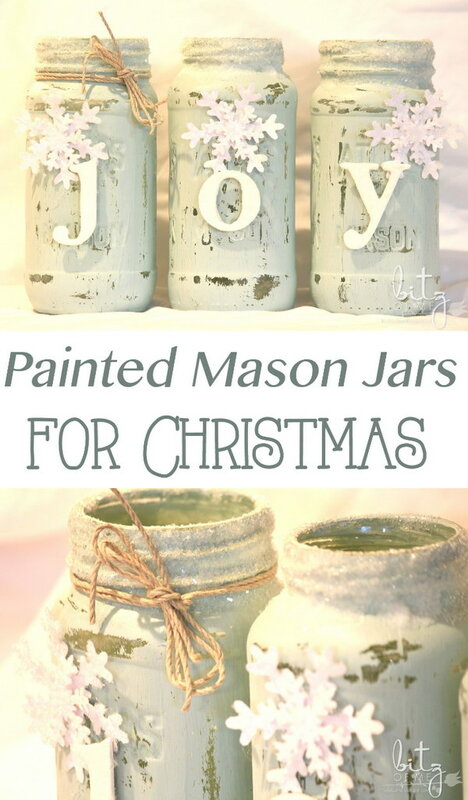 Mason jars make an affordable Christmas gift and decoration around the holidays. They will add a touch of rustic country charm to your Christmas decorations, and show off your creativity and artistic skills. 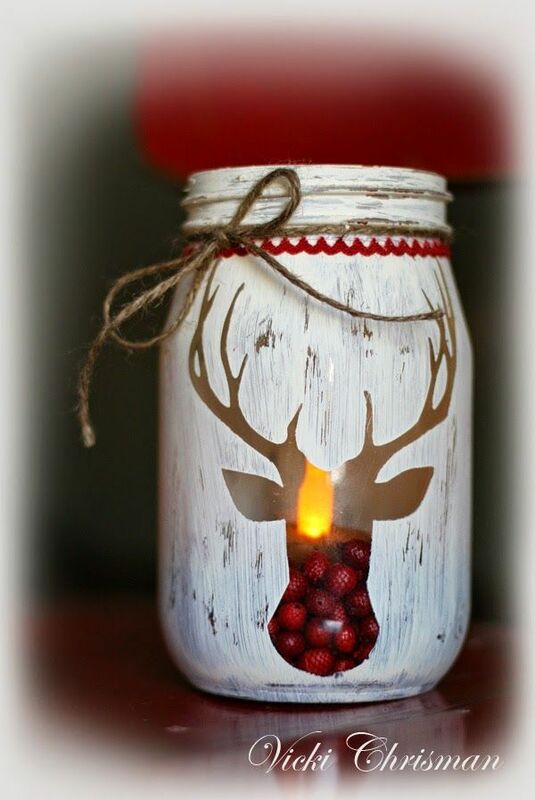 Check out these DIY Mason jar ideas & tutorials for holiday, which include DIY snowy Mason jar, candy cane Mason jar vase, stenciled deer head jars, Mason jar Christmas tree and other Mason jar crafts for Christmas. 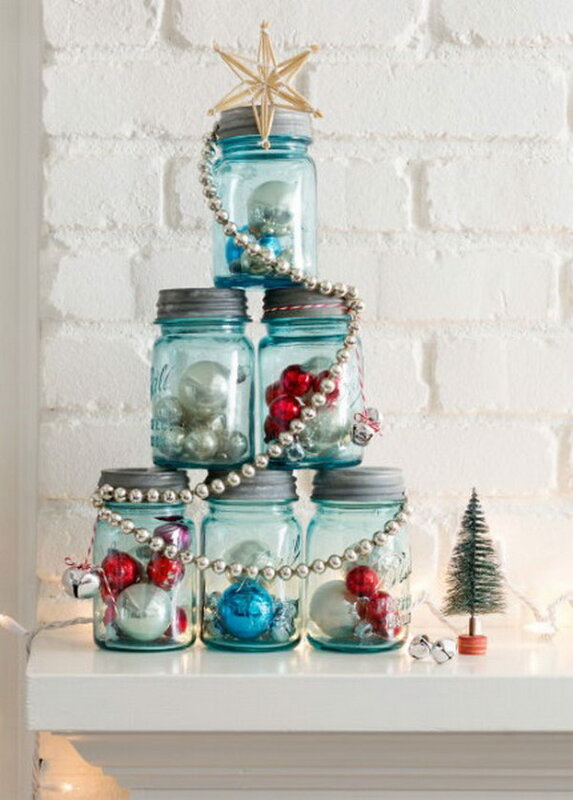 When it comes to Mason jar decorations for Christmas, there are endless ideas. These Christmas decorations are so easy to make, and they’re so elegant and pretty. Get the tutorial via yellowblissroad. This snowy mason jar looks so classy and elegant. 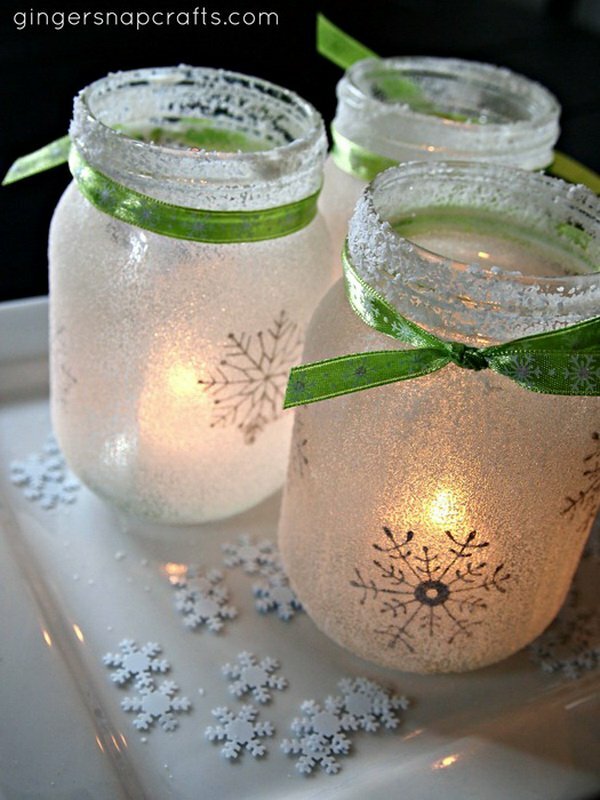 And it’s easy to make with mason jars and epsom salt. Tutorial via decoart. Make some antique feel snow globes for your holiday mantle or tucking in with the rest of your decorations. Get the tutorial via whipperberry. Glitter, gold, mason jar and flowers. 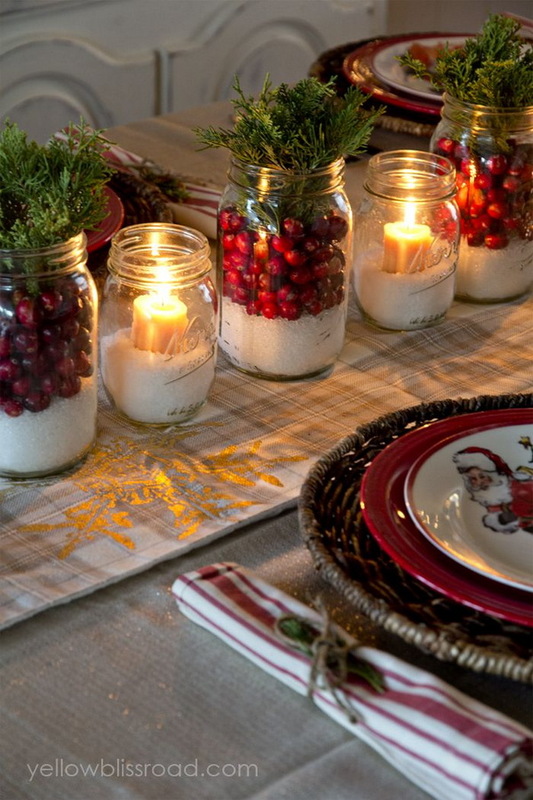 These mason jar vases are so pretty for the Christmas decorations. Get the tutorial via classyclutter. 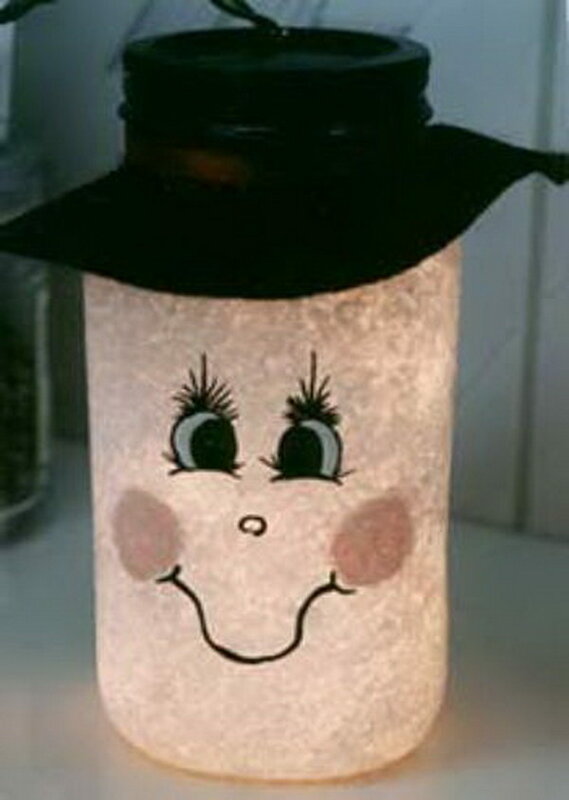 a paint dauber, Mod Podge, foam brush, tea lights and salt. And they are esy to do in just a few minutes. Get the tutorial via gingersnapcrafts. 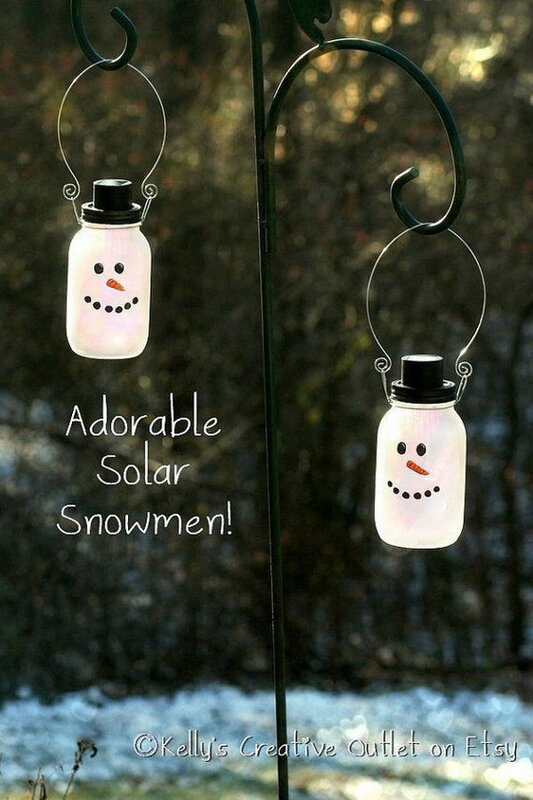 How cute would these be hanging outside your window all winter long? To buy yours via etsy. Get a little more creative (and thrifty) with your flower arrangement, with the idea to create cute candy cane vases to display your beautiful holiday flowers. Get the tutorial via proflowers. 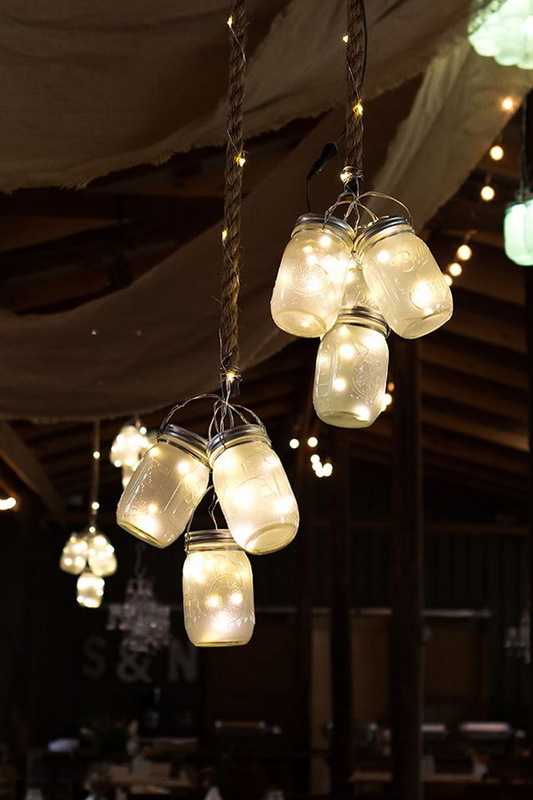 Clusters of LED mason jar lights hung outside to add warmth to your yard. Get the tutorial via allthingsheartandhome. 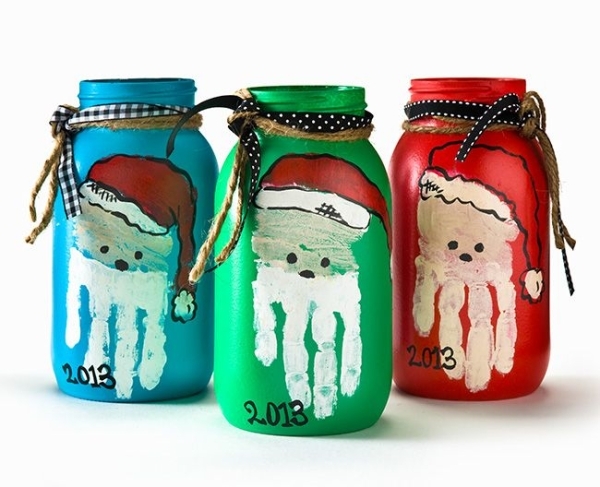 Love these precious hand print jars from holiday kids crafts. Get the tutorial via allfreekidscrafts. 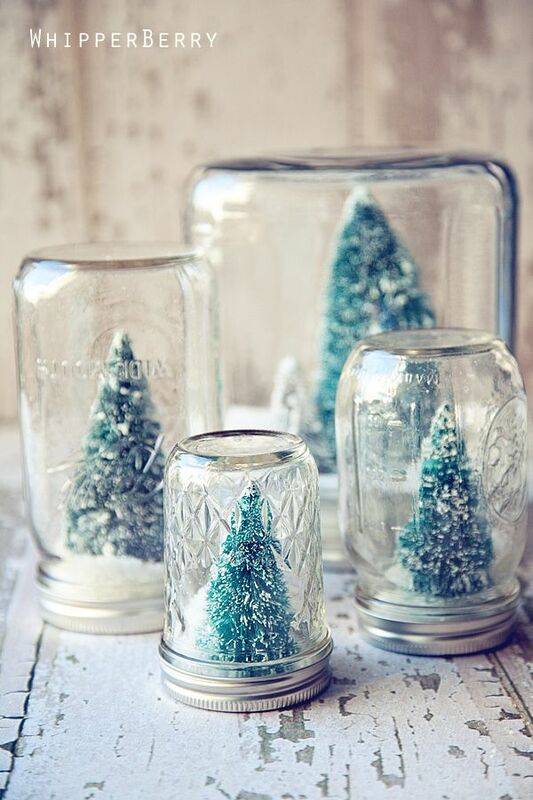 These little jars are incredibly easy to make and so pretty and elegant for holiday decoration! Get the tutorial via maisondepax. 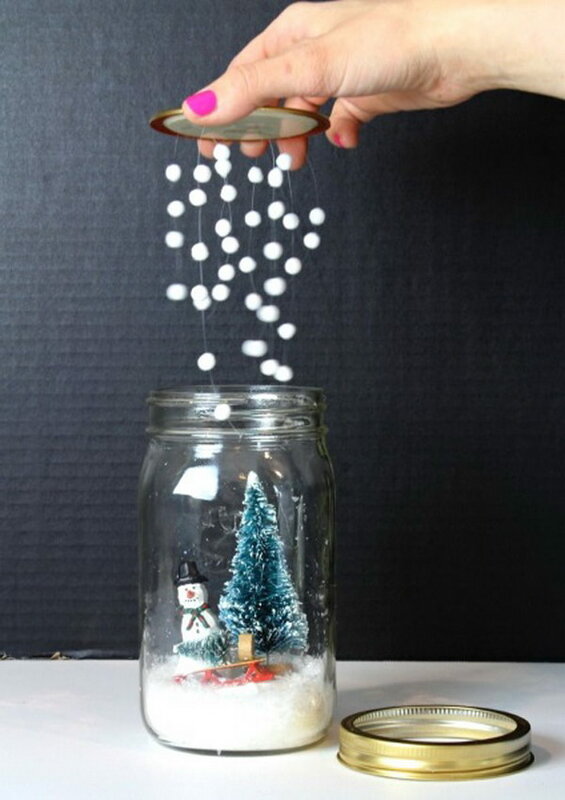 This DIY snow globe looks like a little magical place inside of a jar and your kids will surely like it. Get the tutorial via bitzngiggles. These are simply adorable and you can actually have so much fun to make with your kids. Light up your kids’ room in such a charming, festive way with this light project. DIY instructions via craftymorning. Add a dash of sparkle to your Christmas tables or mantel with this glitter candle with a winter spin! Get the tutorial via alittletipsy. Get the tutorial via thebudgetdecorator. Combine a Mason jar, red chalky paint and a few trimmings and you get this cute Christmas Santa belly pinted mason jar. source. 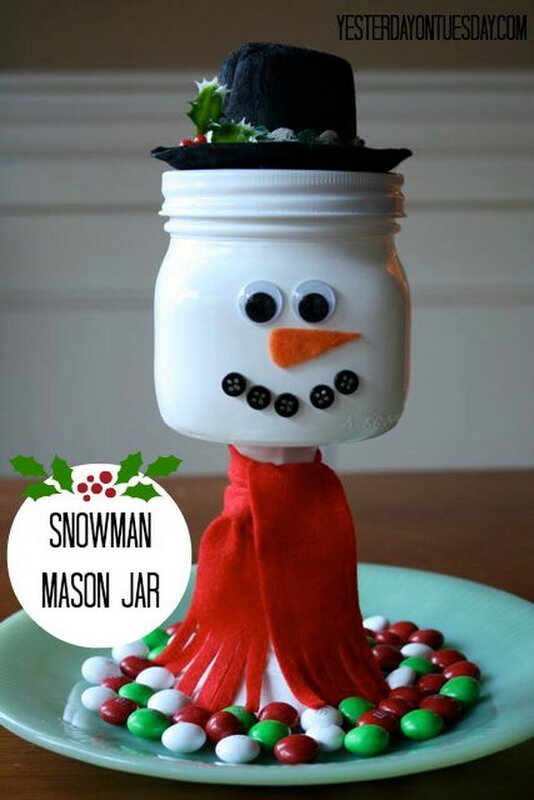 Make this cute Snowman Craft Candy Jar for winter, makes a fun Christmas gift too. What you need are need mod podge, gold foil spray paint, burlap string, extra fine gold glitter, gold string, and blue painters tape. Get the tutorial via yesterdayontuesday. Take 3 mason jars. First put the scrapbook letter stickers on the outside! 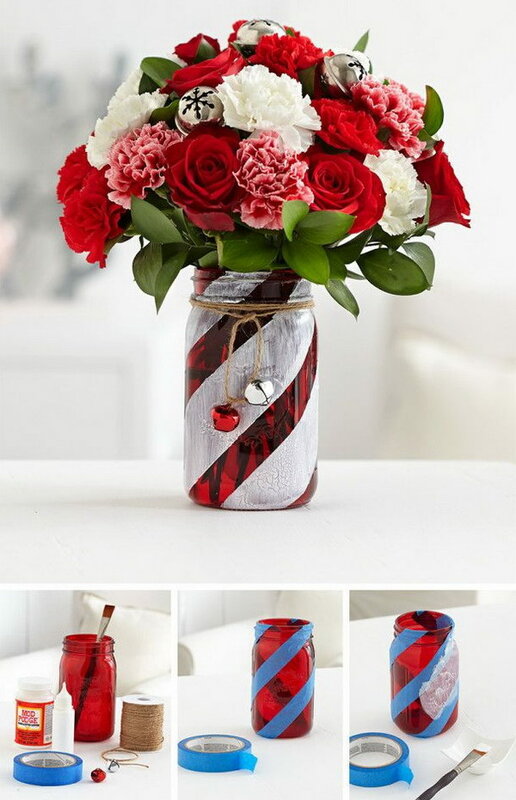 Next was to tie some colorful plaid ribbon around the tops of the jars. Put the candles into the mason jars and viola! Get the tutorial via lovepastatoolbelt. Stencil a deer head design on mason jar and then paint using acrylic craft paint and a foam brush. Get the tutorial via bloglovin. Customize this snow globe DIY to make a frosty cluster of globes for your Christmas decoration. Get the tutorial via classyclutter. Fill six like-sized canning jars with ornaments, tinsel, greenery, or anything you want to make this gorgeous Christmas tree for your holiday mantel or entryway. Via countryliving. Take some empty mason jars. Tie some red ribbon and an ornament around the top. 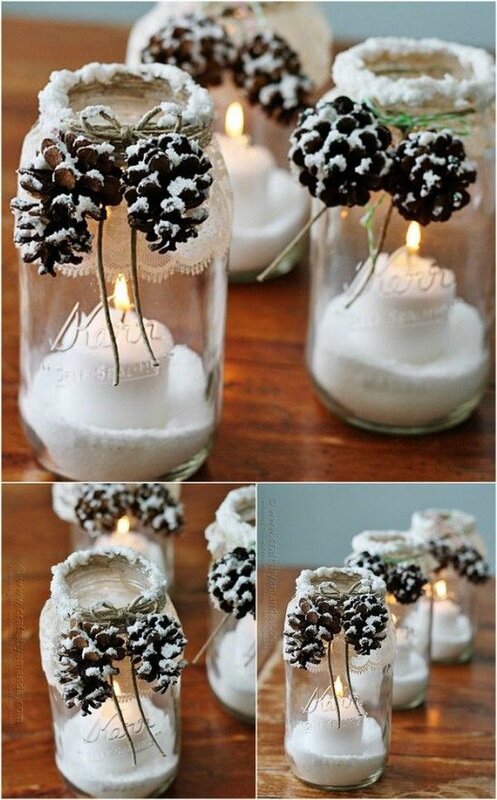 Super cute and simple idea to use recycled mason jars as easy Christmas decoration. Get the tutorial via theitaliandishblog. Get the tutorial via craftathome. 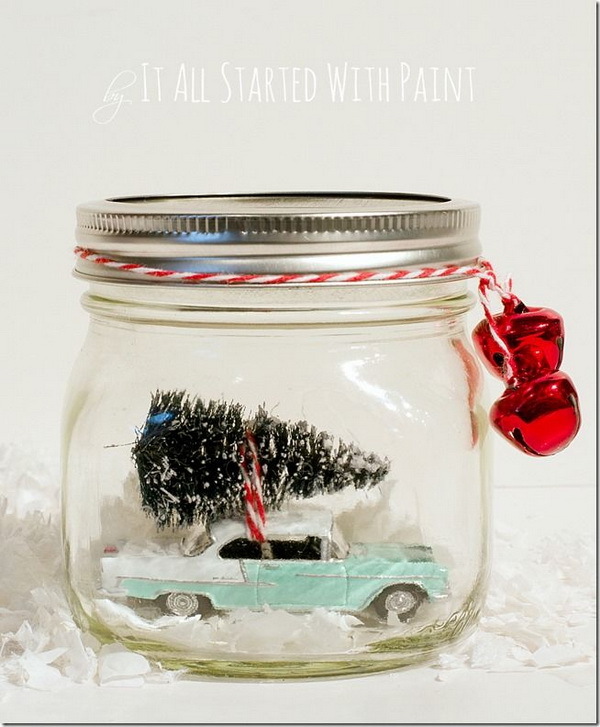 Follow the easy tutorial on how to make fun, glittery and snowy look painted mason jars . Get the tutorial via tinybitzofme. Add to the ambiance with these cutest festive painted mason jar characters and figures luminaries. Via etsy. This idea is cute and Super easy. Just put glitter on inside of mason jar, set a candle inside and put a small purple bow on the outside of it. Get the tutorial via cakerypapery. 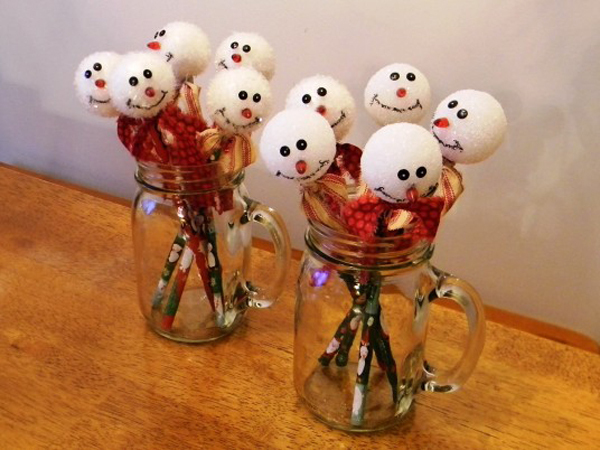 Make this snowman mason jar vase to add some festive decor to your next Christmas! Get the tutorial via weekendcraft. 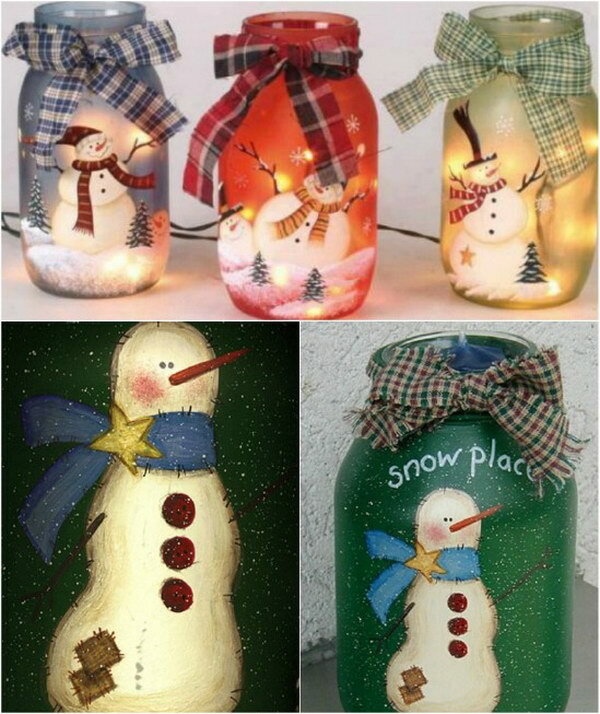 This snowman mason jar idea is cute and fun to do, especially if you love to paint. Get the tutorial via source. 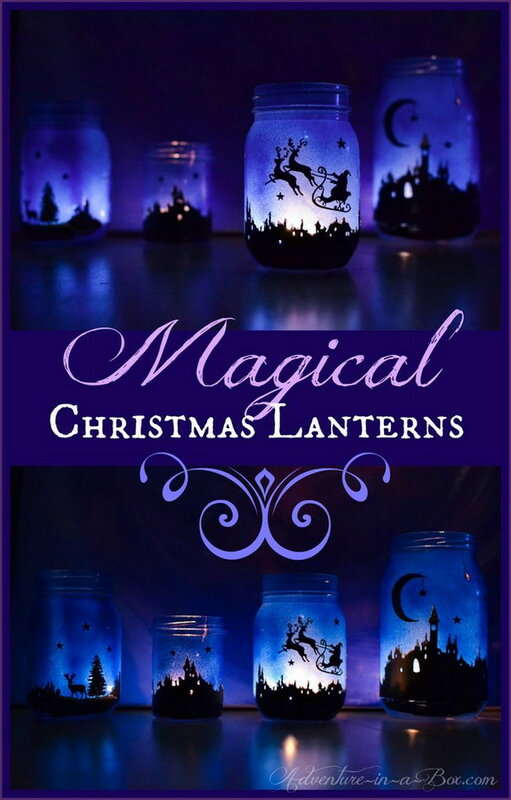 Learn how to make these quick and easy magical Christmas lanterns out of mason jars. They will look amazing when illuminated at night. Tutorial via adventure-in-a-box. These are so cute and just make you feel happy. Via housetodecor. Incredibly easy to make and this little jar is so pretty and cute! Get the tutorial via chicacircle. 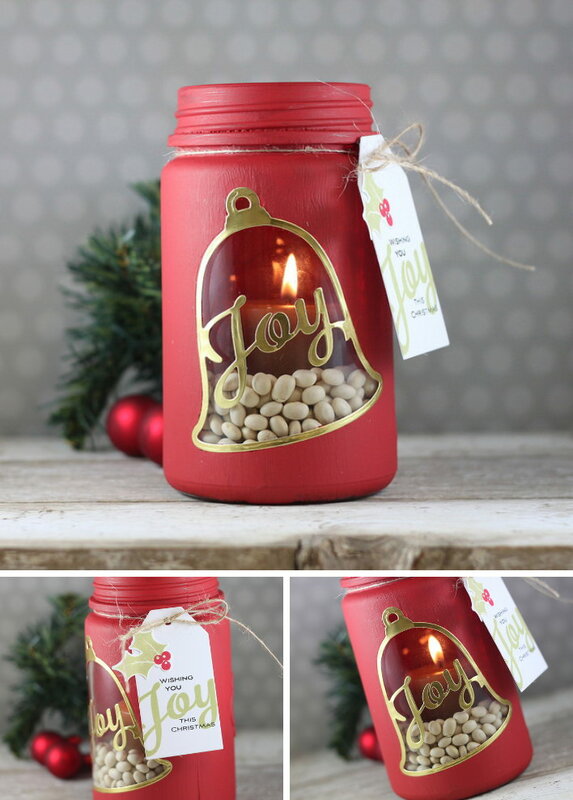 Illuminate your Christmas decorating with this easy to make township candle jar. Get the tutorial via shabbyartboutique. Love the simplicity of this winter decor. 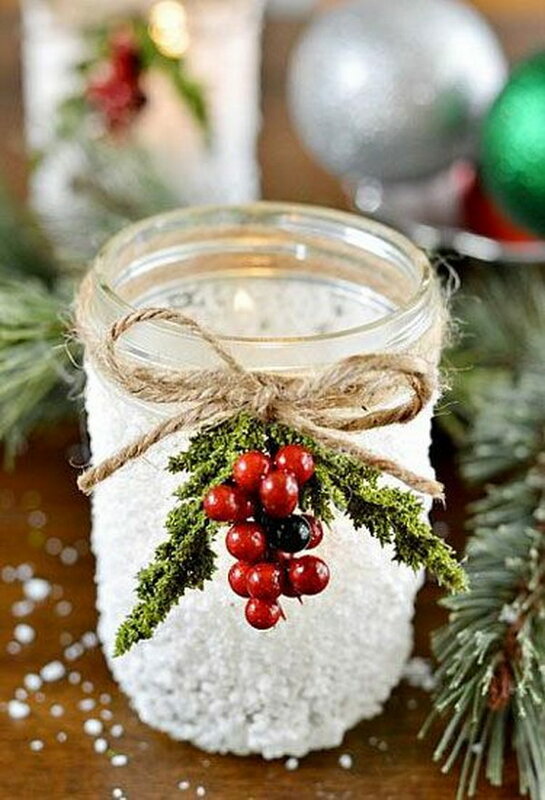 What you need is Epsom salt, glass jar, twine, lace, pinecones, candle and hot glue gun. Get the tutorial via craftsbyamanda. These are perfect for an easy Christmas centerpiece or for Christmas mantel decor. Get the tutorial via organizeyourstuffnow. 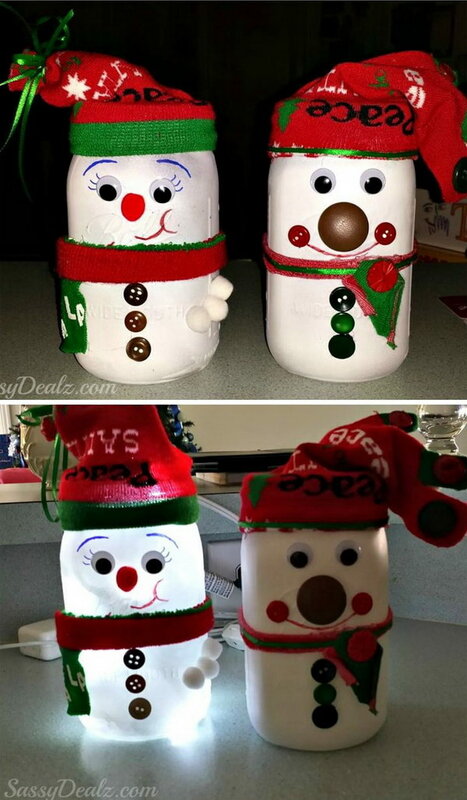 This is easy for kids to make for Christmas gifts. Get the tutorial via mollymoocrafts. This cute candle holder was made with a solid bell die out of a sheet of Adhesive Label and some red Acrylic paint. 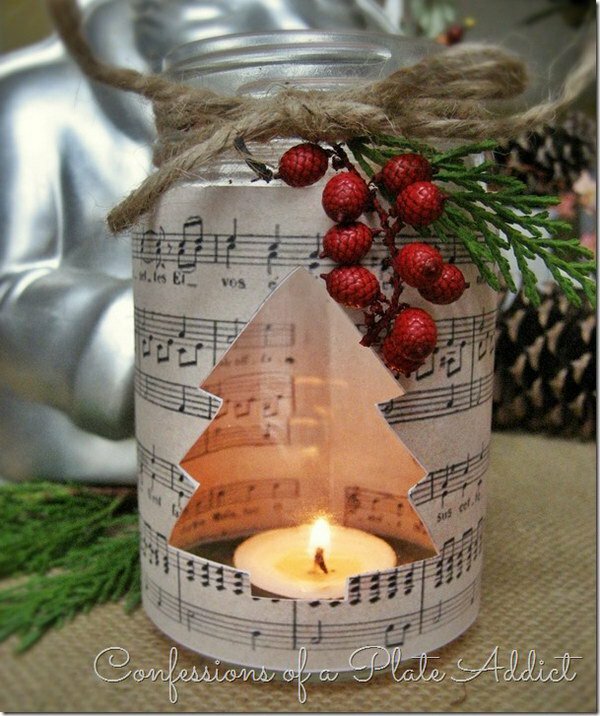 What an easy and affordable Christmas decoration to make. Get the tutorial via soapboxcreations. Simply beautiful shabby chic. Get the tutorial via craftsbyamanda. 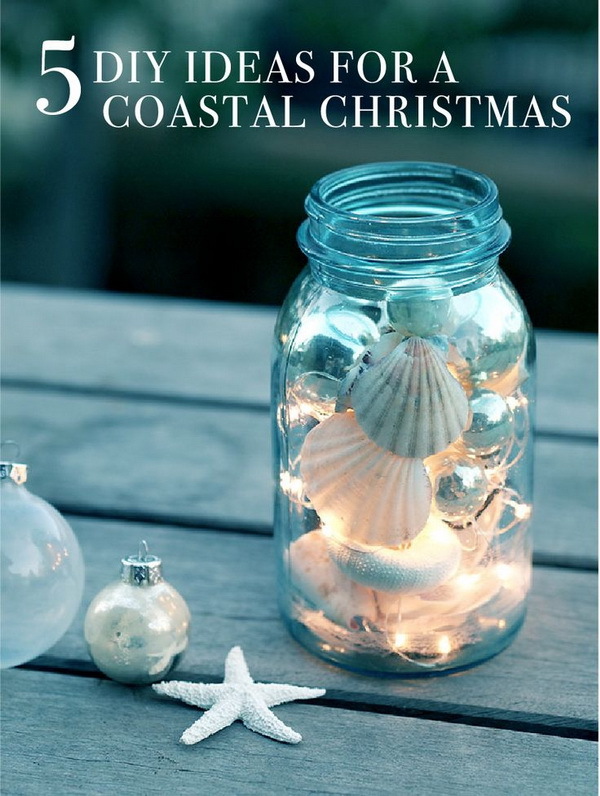 Bring the coast to your house with this DIY luminary jar. Via ebay. 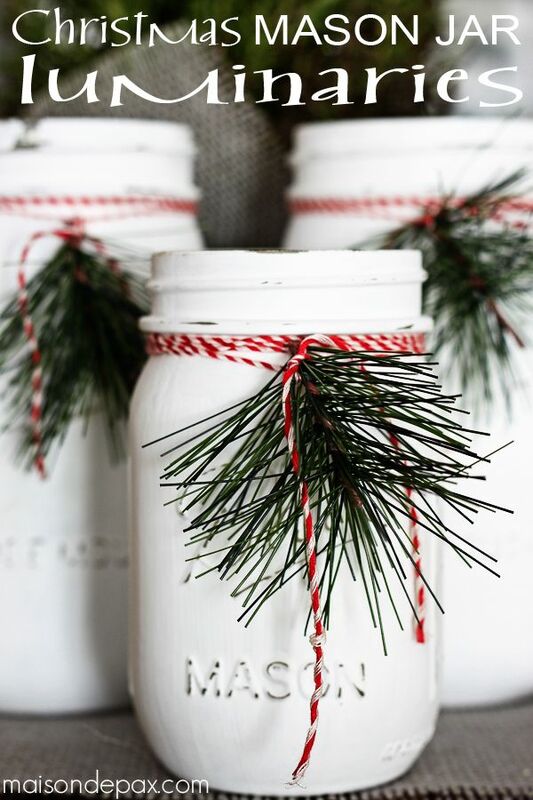 Get the tutorial via masonjarcraftslove. 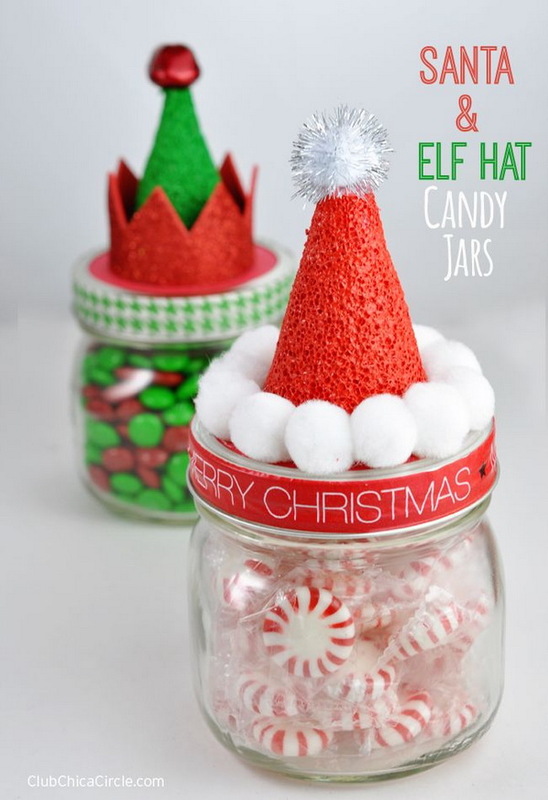 These easy DIY Christmas Jars are unique and adorable idea to give as gifts at Christmas time. Get the tutorial via chicacircle. 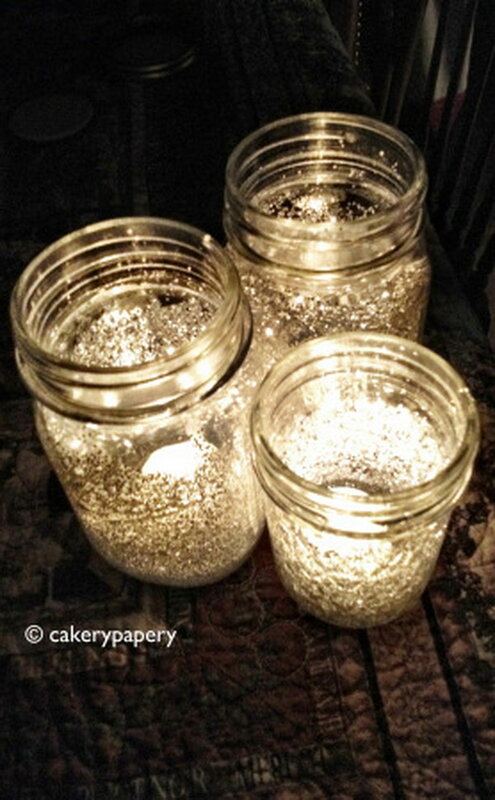 Create the appearance of fireflies in a jar with this DIY twinkle lights in mason jars. And hang clusters them from the ceiling for a gorgeous and magical outdoor decoration. Get the tutorial via sarahhearts. This could make a awesome gift idea for music lovers. It also adds vintage style to your home decorations. Get the tutorial via confessionsofaplateaddict. 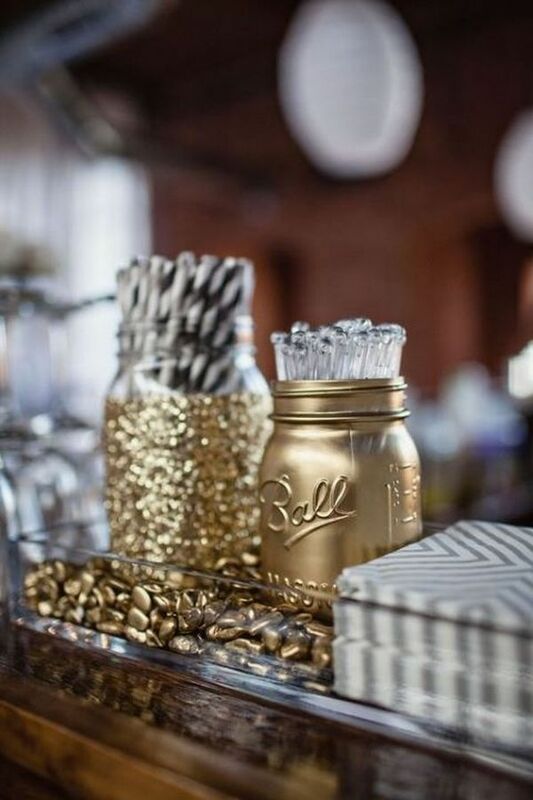 Make fantastic accessories on a refreshments table with these gold and glitter mason jars. Simple and easy. Get the tutorial via homedit. Oh my gosh….these are so great. I am going to make several to give as neighbor gifts! These are just wonderful. Loved them all. Thanks for posting! Been looking for one craft to do instead of ten at a time. I get overwhelmed, so this is terrific. It is certainly seasonal and can do so much. Dress them up or make them simple and elegant. I don’t need boxes and boxes and boxes of craft supplies for those ten crafts. I love these ideas.. I am a sucker for mason jar crafts.